This is a self-estimation instrument regarding an individual’s energy and stress experiences . It is based on two subscales that indicate the mood levels regarding: 'experienced stress' and ‘experienced energy’. The subjects are to answer certain statements that are placed on a six-grade scales, from 0 = not at all, to 5 = very much. Examples of the statements are “How much do you feel relaxed”, “How much do you feel tense”. The SE-scale is based on an early checklist, the Mood Adjective Check-List  and has been further modified and translated into Swedish . The instrument has been validated in a number of studies i.e. [21, 23]. Cronbach's alpha was 0.84 for the stress subscale, and 0.74 for the energy subscale. The score range is from 0 – 5 for each subscale. The HADS is a rating scale regarding degree of anxiety and depression. It was constructed for use with physically ill people , and has been validated and reliability tested . The HAD scale consists of fourteen statements with four response alternatives ranging from 0 to 3. Examples of the questions are ““Do you feel tense or wound up?”, “Do you take as much interest in things as you used to?” There are seven statements concerning anxiety and seven for depression, wherein values under 6 are considered normal, those between 6 and 1 are borderline, and all values over 8 points are indicative of a probable depression or anxiety diagnosis . The score range is from 0 – 21 for each subscale. Cronbach's alpha was 0.74 for the depression subscale, and 0.82 for the anxiety subscale. Outer measurements are 2600 × 1650 × 1330 mm. In total it contains 600 litres of water and 350 kg’s of magnesium sulphate salt. To maintain a correct water temperature (approximately outer skin temperature, 35°C), heating foil is placed in the lower section of the floating tank, regulated by a thermostat and heated in regular intervals. The door is outwardly opened. The inside of the lower section had ribbed bottom to prevent slipperiness. Between flotation sessions, water is filtered and sterilized with UV-light along with weekly addition of hydrogen peroxide where oxidization occurs. The sterilization of water between flotation sessions takes approximately fifteen minutes. Filters are regularly changed and the inside of the flotation tank is cleaned twice a week in accordance to public health board recommendations. A two-way mixed Pillais’ MANOVA was carried out with Time (before, after) as the within-subjects factor and Group (flotation, control) as between-subjects factor. Dependent variables were the psychological variables which in earlier studies e. g.  have been proven to strongly intertwine, i. e., stress (SE), energy (SE), anxiety (HADS), depression (HADS), dispositional optimism (LOT), and sleep quality (SQ). The analysis showed significant effects for Time (p <0.001, Eta 2 = 0.48) and for Time × Group interaction (p = 0.008, Eta 2 = 0.26). There was no significant effect for Group (p = 0.248, Eta 2 = 0.13). The results from the univariate F-tests are given below. For means and standard deviations, see Table 1. ** = significant effect, p < 0.001; n.s = non significant effect. The analyses yielded a significant difference for Time [F (1, 61) = 6.44, p = 0.014], and a descriptive analysis showed that stress was reduced from 1.85 (SD = 1.10) to 1.35 (SD = 1.04) after the treatment period. There was also a significant interaction Time x Group [F (1, 61) = 8.23, p = 0.006], and further analysis (pair-samples t-tests, 5% level) showed that the stress was reduced for the flotation group (t (36) = 4.42, p <0.001) but not for the control group (t (27) = 0.169, p = 0.867). The analyses yielded a significant difference for Time [F (1, 61) = 19.42, p <0.001], and a descriptive analysis showed that the anxiety was reduced from 7.54 (SD = 4.15) to 5.43 (SD = 3.3.79) after the treatment period. There was also a significant interaction Time × Group [F (1, 61) = 17.90, p <0.001], and further analysis (paired-samples t-tests, 5% level) showed that anxiety was reduced for the flotation group (t (36) = 5.67, p <0.001) but not for the control group (t (27) = 0.231, p = 0.819). The analyses yielded a significant difference for Time [F (1, 61) = 7.68, p <0.001], and descriptive analysis showed that depression diminished from 4.24 (SD = 3.42) to 3.13 (SD = 2.73) after the treatment period. There was also a significant interaction Time × Group [F (1, 61) = 13.32, p = 0.001], and further analysis (paired-samples t-tests, 5% level) showed that depression was reduced for the flotation group (t (36) = 4.74, p <0.001) but not for the control group (t (27) = 0.508, p = 0.616). The analyses yielded a significant difference for Time [F (1, 61) = 9.83, p = 0.003], and a descriptive analysis indicated that optimism increased from 20.30 (SD = 5.18) to 22.27 (SD = 5.06) after the treatment period. There was also a significant interaction Time × Group [F (1, 61) = 10.26, p = 0.002], and further analysis (paired-samples t-tests, 5% level) showed that optimism was increased for the flotation group (t ( 36) = 4.36, p <0.001) but not for the control group (t (27) = 0.06, p = 0.953). The analyses yielded a significant difference for Time [F (1, 61) = 10.11, p = 0.002], and a descriptive analysis indicated that sleep quality increased from 24.37 (SD = 8.64) to 27.83 (SD = 8.83) after the treatment period. There was also a significant interaction Time x Group [F (1, 61) = 9.38, p = 0.003], and further analysis (paired-samples t-tests, 5% level) showed that sleep quality was increased for the flotation group (t (36) = 3.95, p <0.001) but not for the control group (t (27) = 0.323 , p = 0.749). Correlation analyses (Pearsons’) between the variables Stress and Sleep quality were also performed, and there was a significant negative correlation both before intervention (r = -0.585, p <0.001) and after intervention (r = -0.507, p <0.001). 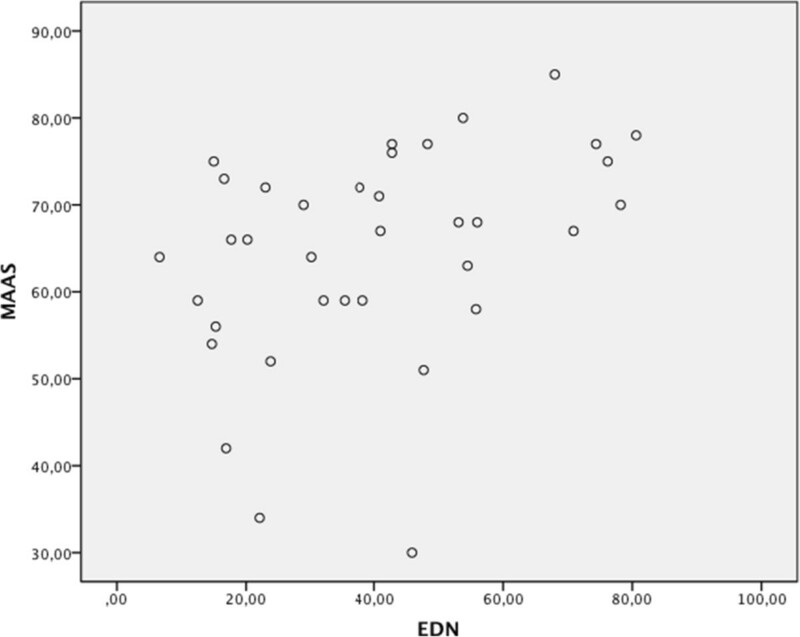 In order to further evaluate this correlation the variable EDN was divided into three parts (low, medium, high) thereby creating the independent variable EDN-group. Cut-off points for these levels were 33.3% and 66.7%. Analysis with one-way ANOVA with EDN-group (low, medium, high) as the independent variable, and MAAS as dependent variable yielded a significant difference between the groups [F (2,35) = 4.033 p = 0.027, eta 2 = 0.39]. A post–hoc analysis (Bonferroni) showed there was a significant difference between “low” and “high” (p = 0.029) but not with comparison to the medium condition (ps = 0.163); the persons obtaining a higher degree of altered states of consciousness in the tank also experience more mindfulness in their daily life. The purpose of this study was to evaluate psychological effects in a series of treatments of flotation-REST in healthy participants (i.e. not being on sick-leave absence). The main findings were significant decreased experienced stress, worst pain, anxiety, and depression - as well as significant increased sleep quality and optimism for the flotation-REST group compared to the control group. In addition, it was found that the dimensions mindfulness and altered states of consciousness, at least to some extent, seemed to be overlapping constructs. Many of the participants wrote comments, without being asked to do so, on their individual questionnaires. They continuously emphasized how their pain - which many of them had been having for many years - was practically gone after the 12-session flotation program. They mentioned further how they felt relaxed, slept better, and were over-all happier and healthier. Many of the participants had prior to the floating sessions been using a range of different methods to reduce pain, stress and other individual health issues. Medicines, yoga, massage, and physiotherapy were some of the treatments mentioned, and never had they so successfully been relieved from pain, tension, stress etc.